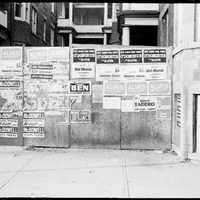 Image of wall along College St. featuring political signs for George Ben, Joe Pantalone, John Medeiros, Bill Moniz, Joe Pimental and Manuel Garcia, ? LoFranco, ? McDowell, ? Case, Tony O'Donohue, Robert Taddeo, and Manuel Alves for the Toronto Municipal elections of 1978. Domingos Marques (? ), “Political posters on College St.,” York University Libraries | Clara Thomas Archives & Special Collections online exhibits, accessed April 20, 2019, http://archives.library.yorku.ca/items/show/2234.